About ¾-mile along Holy Island Road which runs from the A1 to Holy Island, south of the level crossing on the East Coast main line. Passenger buildings and platforms demolished. A section of wall and the brick extension to the former signal box survive. Notes: Beal is a farming hamlet on a low hill a quarter of a mile east of the station. The surrounding landscape is tranquil, and the station is close to the coastline with its extensive sand flats and marshland. 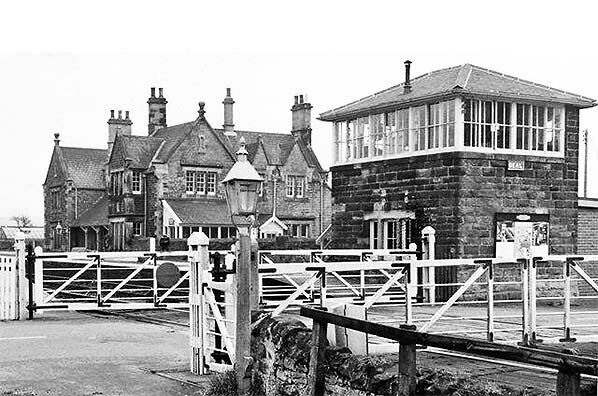 The Newcastle & Berwick Railway spent generously on its stations, providing lavish facilities even in sparsely populated countryside, and Beal was given a fine building ‘of manorial proportions’ (Biddle 1973) and more than adequate goods facilities as it was the closest approach by the railway to Holy Island (or Lindisfarne). The island had a population of about 250, but as the cradle of Christianity in Northumberland it traditionally drew pilgrims who revered the seventh century SS Aidan and Cuthbert, and the evocative ruined monastery and the castle on its rock outcrop also brought visitors who crossed the treacherous causeway from the mainland. The origin of the place name Beal is Old English beo-hyll (‘bee hill’). Lindisfarne is thought to mean either ‘island of the people from Lindsey’ (now part of Lincolnshire) or ‘island of travellers to Lindsey’, perhaps denoting a settlement of regular traders with that area. The station at Beal opened with the line in 1847, and its ‘Jacobethan’ building was a typically dignified and commodious Newcastle & Berwick Railway design. It stood south-west of the line on the down platform. 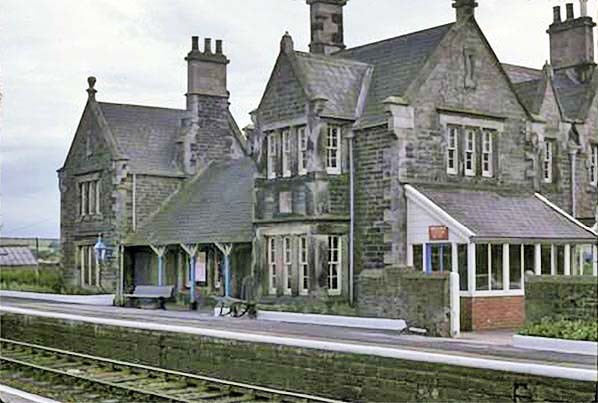 In common with other N&B stations it was constructed of sandstone ashlar under a Welsh slate roof, and was given the distinctive raised gables, ball finials, gable-end kneelers and tall chimneystacks. This building gave the immediate impression of being two substantial houses with a recessed single-storey block between them, the roof swept down to form a verandah. The larger of the two houses was for the stationmaster and his family, and the smaller was the porter’s family home. On the platform elevation the north-western house possessed a two-storey gabled bay whist the south-eastern one did not have this refinement. Equal care was taken over the side elevations, the north-western having three gables of differing sizes and a charming wooden porch. The south-eastern elevation was given only one gabled ‘half-dormer’ and a single storey block extended south-west. Facilities on the up platform were much less flamboyant, but the stone-built waiting shed nevertheless possessed dignity. It was of the standard N&B design with a pent roof sloping down towards the platform edge, originally open-fronted but eventually given a timber-and-glass front by the NER. Passengers transferred between platforms via the level crossing. No footbridge or subway was provided. Although it is not clear on the earliest maps of the station, later maps indicate that the down platform stretched much further south-east than did the up platform. As to goods facilities Beal was provided with a very large stone-built goods warehouse, its design complementing the station building. The 1898 OS plan shows two sidings trailing north-west from the up line, one entering the goods warehouse, and a crane (5-tons capacity) is also marked. A further short siding is shown branching from the down line and ending behind the down platform. A gate cabin was provided at Beal, but the 1873 ‘Block Report’ noted that it was too small for block working and the new box was constructed by October 1877. This was probably an N1 stone design, extended to N2 from 1901. In 1891 a 20-lever frame was in use, but in 1901 a McKenzie & Holland 30-lever frame was installed. The role of Alnwick as the regional shopping and employment centre can be seen as it is the destination of up trains in the morning, which reversed at Alnmouth, and later in the day the town could be reached by changing trains at Alnmouth. In the down direction the 11.07am departure is the 8.00am from Newcastle, stopping at all stations (including Smeafield on certain days) to Berwick, which reaches Beal at 10.38am and is then shunted aside to allow the semi-fast Edinburgh train to call at 11.00am. Passengers from stations to the south could change at Belford or Beal from the stopping train to catch the semi-fast to Berwick or Edinburgh. The timetable shows the 10.38am arrival and 11.07am departure as separate trains as passengers would officially be permitted to remain aboard during the shunting procedure. By the turn of the century the ECML in Northumberland was becoming congested, and the NER undertook major re-signalling schemes to ease traffic flow at several places (Belford, Tweedmouth, Morpeth, Alnmouth and Benton Bank) between 1901 and 1908, and work at Chathill in 1911. Slow-moving goods trains were a particular impediment, and the NER addressed this problem by providing ‘Independent’ lines – essentially long loops – at intervals to accommodate goods trains while faster passenger services could overtake them. In 1901 an ‘Up Independent’, about two miles in length, was installed between Goswick and Beal, with a complementary ‘Down Independent’ added in 1918. 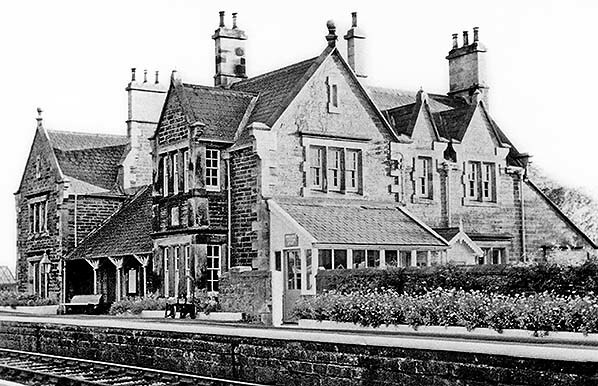 Several of the ECML wayside stations in north Northumberland were closed by the LNER from 1941 until 1946, but Beal was one of the few to remain open throughout this period, the others being Alnmouth , Chathill, Belford and Tweedmouth. The legacy of the LNER at Beal was limited, although the company’s distinctive running-in nameboards with metal letters pegged to a wooden board were installed as neighbours to the NER oil lanterns which lit the platform. The nameboards read ‘Beal for Holy Island’. The lanterns and nameboards were never to be replaced. By this time many of the wayside stations between Newcastle and Berwick had a minimal service, and some had no Sunday calls. Sunday trains ceased to stop at Beal in September 1963. Beal station was a late 1960s closure for which Dr Beeching cannot be held responsible. The Reshaping of British Railways (‘Beeching Report’) of March 1963 was remarkably kind to the Northumbrian ECML stations. The appendix map No.3 (with its crude division of station annual receipts into three bands – £0 to £5,000 / £5,000 to £25,000 / £25,000 and over – and its equally inept cartography) indicated that between Newcastle and Berwick every station apart from Morpeth and Alnmouth (and Alnwick, on its branch) fell into the lowest revenue band; Cramlington, Heaton and Manors were not shown on the map, being omitted from a ‘congested’ area. Despite the light usage of almost every station, only Pegswood was recommended for closure; this station had already survived a TUCC closure enquiry in 1958 and the enquiry into the’ Beeching’ proposal for its closure was deferred until 1966. Tweedmouth was named in the report, but as a station already under consideration for closure. The omission of Beal from the proposed closures seems remarkable. On 26 April 1965 Beal’s goods facilities closed. 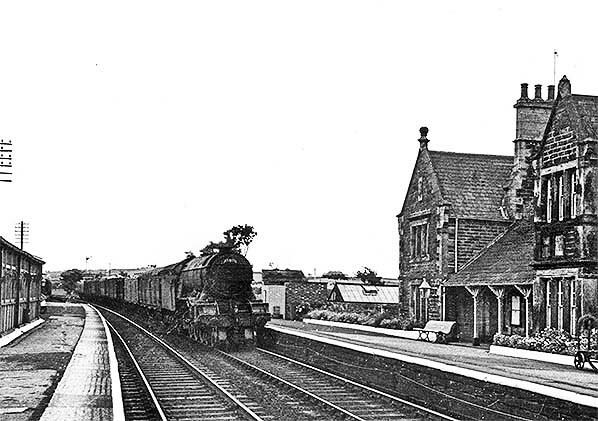 A further review of the financial viability of passenger stations and services between Newcastle and Berwick, and on the Alnwick branch, took place with a traffic census on the weeks ending 10 July and 16 October 1965 to represent summer and winter use. At Beal station the July census found 7 passengers joining and 11 alighting on Monday-Friday while 6 joined and 6 alighted in October; Saturday figures showed 4 joining and 20 alighting in summer, but only 6 joining and 10 alighting in winter. No trains had called on Sunday since September 1963.Travel was found to be almost entirely to or from the south. Interviews in March 1966 identified no regular passengers at Beal station (being defined as those known to use the train services on three or more days a week). 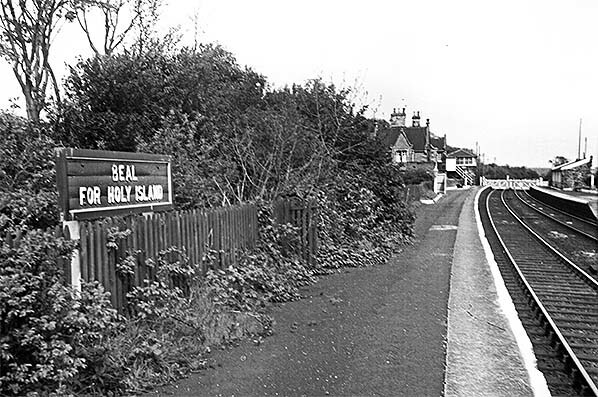 As intimated earlier, the use of Beal station by residents of, and visitors to, Holy Island was governed by the tides, the timings of which change from day to day – a situation possibly unique among British stations; therefore passengers would not be able to use the same trains repeatedly for access to the island. Moreover it is likely that a fair proportion of passengers who joined trains at Beal were using ‘Holiday Runabout’ or ‘Rover’ tickets, and such passengers would therefore not be recorded as having tickets issued at the station. Consequently the paltry 201 tickets issued at Beal in 1967 understated the number of passengers who used the station. The outcome of the traffic review of 1965 was the publication on 3 March 1966 of a proposal to close Pegswood, Widdrington, Belford and Beal stations, as well as Alnwick on its branch from the ECML at Alnmouth. Regarding Beal station British Rail assured the TUCC that its closure (‘with only ten passengers’) would be unlikely to deprive Holy Island of visitors, and that they could use buses to reach a point near Beal station and then take taxis to the island. BR noted that in their summer 1965 survey ‘Holiday Runabout’ ticket users were included in the summer survey of passengers joining and alighting at Beal, but stated that ‘the use of these tickets is declining’ [hardly surprising as closures were reducing the choice of destinations to visit!]. Beal would be left some distance from a railhead as a result of the proposed closures, being approximately midway between Berwick (9 miles north) and Chathill (12 miles south). A strong case was made at the closure hearings for the retention of Belford station (seven miles from Beal) in preference to Chathill: these are outlined on the Belford station page. The final trains called on Saturday 27 January 1968 and official closure was two days later. Both platforms were cut back on 1 March 1970, and the up side waiting shelter was removed, possibly at the same time. The station building was, regrettably, demolished in 1979. Beal signal box received a brick extension at an unknown date. A new 31-lever frame was installed in April 1958. In August 1966 the ‘Independent’ up and down goods lines between Beal and Goswick were abandoned. Barriers replaced the traditional crossing gates on 13 April 1980, and the signal box was abolished on 18 April 1982, the crossing thereafter being supervised from Tweedmouth by CCTV. The stone signal box has been removed but the brick extension is retained as a relay room. ‘Station Cottages’, just west of the former passenger station, are still in use. 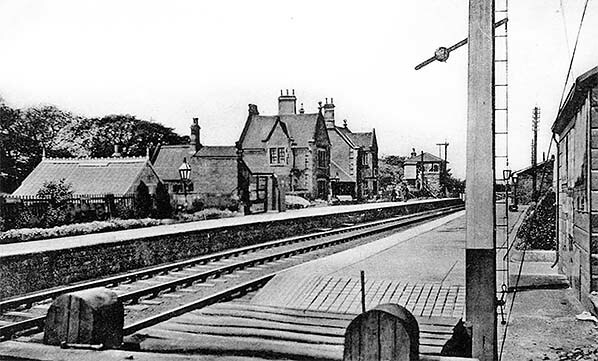 A general view of Beal station looking north-west from the up platform c1906. The station building dominates the down platform, a fine ‘Jacobethan’ Newcastle & Berwick Railway structure of 1847. 1867 1:2,500 OS map. The station is conveniently situated to serve the neighbouring hamlet of Beal several minutes’ walk to the east. The large station building can be seen on the down platform, south-west of the through tracks, with the much smaller waiting shed on the opposite platform. A siding with a long headshunt branches from the down line. From the up line sidings serve the goods warehouse and coal depot (both unnamed). 1898 1:2,500 OS map. The passenger station facilities are as shown on the earlier OS map, but the goods warehouse is named (‘Goods Shed’) and a yard crane is identified. The signal box has been added immediately south of the crossing, on the down side, but is not named. A short terrace of three railway cottages has been constructed a short distance east of the crossing, and two more (semidetached, but shown as one) west of the crossing. 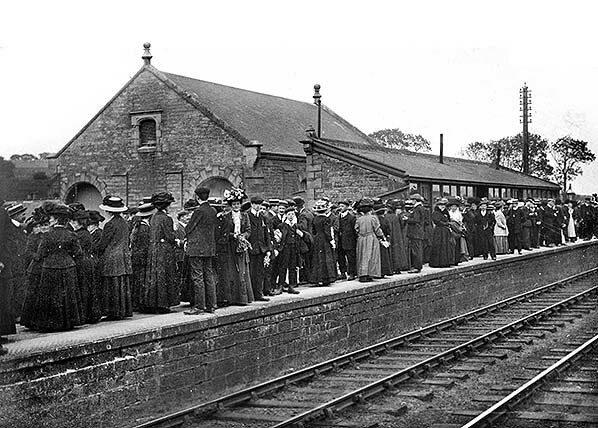 The up platform of Beal station is seen (prior to April 1916) crowded with smartly dressed passengers. The reason for this gathering is not known, but it has been suggested that it might be a party of pilgrims; the absence of luggage suggests that this may be so, and that they have just made a day visit and are returning south, perhaps to Newcastle. An alternative suggestion is that they are passengers ejected from an up train in 1907 as the track ahead at Goswick is blocked. Although the waiting shed, built by the Newcastle & Berwick Railway and enclosed by the North Eastern Railway is of a generous size, it would be unable to accommodate the party on this occasion. In the background is the goods warehouse, displaying the high quality of design and craftsmanship that the N&B Railway lavished on these facilities; many railway companies provided dull, utilitarian structures to serve this purpose. Beal station looking north-west from the down platform in the 1950s. It will be seen how much longer this platform is than the up platform. The LNER running-in nameboard is in the foreground; the letters are not standing well clear of the back board as was normal LNER practice. The main building is in the distance, partly concealed by bushes, with the signal box beyond. The waiting shelter is visible on the up platform. Beal station, looking south-east from the up platform in 1958. On the down platform is the Newcastle & Berwick station building of 1847, in the ‘Jacobethan’ style which was fashionable at the time. The projecting two-storey blocks provided accommodation for the stationmaster (right) and the porter (left) with the verandah between them fronting the waiting rooms. The building was of sandstone ashlar and it carried distinctive N&B elements including kneelers at the sides of the raised gables and decorative stone ball finials on the crest of the gables. A waiting shed is on the extreme left, also of N&B provenance, but under North Eastern Railway ownership the front was given timber-and-glass screening to provide greater comfort for passengers. A northbound goods train is passing through the station hauled by A3 No.60076 ‘Galopia’. The 4-6-2 loco is a Gresley design, originally A1, built by the North British Loco Company, Glasgow, in October 1924. Her first LNER number was 2575, and she was later re-numbered 76. In June 1941 the loco was rebuilt as an A3. In BR ownership she was transferred from Gateshead to 52B, Heaton shed, from which she was withdrawn from service on 29 October 1962 to be stored at Blaydon shed before being cut up at BR(ER) Donacaster works in April 1963. A Derby Lightweight DMU is calling at the down platform at Beal station in the early 1960s and appears to be doing brisk business. The main building is to the right, and the up platform’s waiting shed is visible, with the goods warehouse behind the nameboard on the extreme left. The Derby Lightweights were numbered in the 79xxx series and were never allocated a class number because they were pencilled-in for early withdrawal at the time that class numbers were being decided. All of these vehicles had been withdrawn by 1969. Beal station building in 1964 looking south from the up platform. The architecture of this fine structure is depicted clearly. It was constructed by the Newcastle & Berwick Railway in 1847. It is in the Gothic Tudor/Jacobean (‘Jacobethan’) style which was fashionable at the time. Facing the platform, the projecting two-storey blocks provided accommodation for the stationmaster (right) with the two-storey gabled bay, and the porter (left) with the verandah between them fronting the waiting rooms. The elaborate design of the north-western elevation with its asymmetrically-sized gables can be appreciated, and the timber porch and lean-to will be noted. The building is of sandstone ashlar and it carries distinctive N&B elements including kneelers at the sides of the raised gables and decorative stone ball finials on the crest of the gables. The station garden is tidily presented. 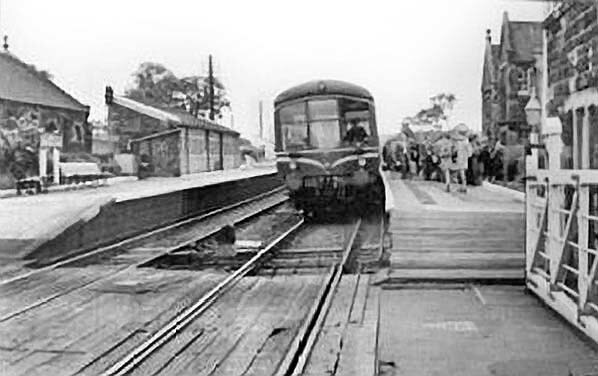 The trolley on the platform is in almost the same position as on the 1958 photograph. The down platform of Beal station is seen in May 1965, looking south over the level crossing. An NER oil lantern takes pride of place. The 1870s NER signal box is to the right, with the N&B main station building beyond. 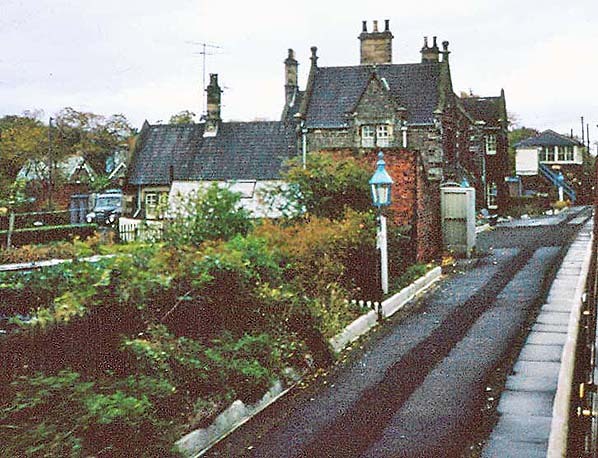 The traditional crossing gates would give way to modern barriers in 1980 and the signal box would close in 1982. The station building on the down platform at Beal seen from the up platform in July 1966. The BR(NE) tangerine-coloured sign on the lean-to is probably an ‘Ambulance Station’ sign with a unique number for this station. Beal station viewed from the Newcastle-Edinburgh train calling at 10.21 on 23 October 1967. The south-eastern elevation of Newcastle & Berwick station building can be seen with its gabled ‘half-dormer’ on the two-storey section and the single-storey section in a cottage style extending to the left. In the foreground is an North Eastern Railway (NER) oil lantern, painted in ‘Oriental Blue’ by British Railways North Eastern Region, and beyond it the brick-built gents’ toilet and timber privacy screen built in NER days. The signal box, also an NER structure, built in the 1870s is in the distance. The station closed about three months after this photograph was taken.